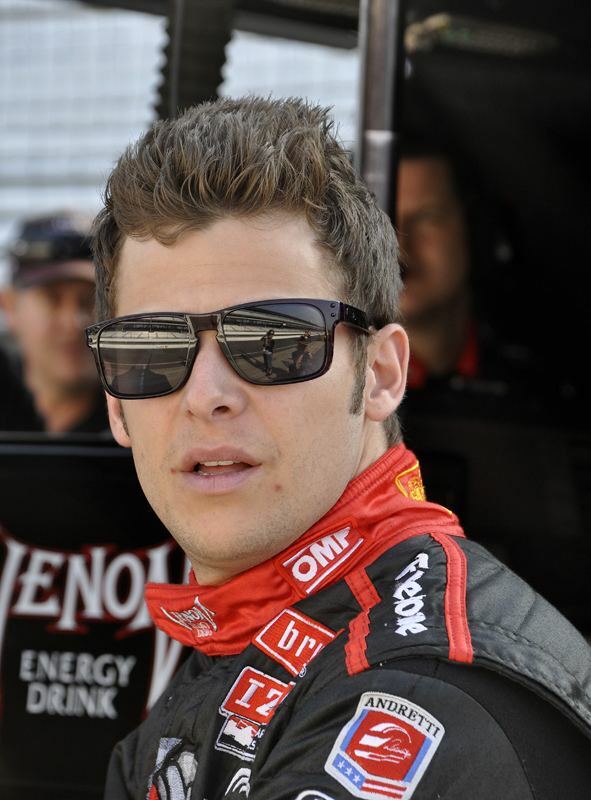 Marco Michael Andretti (born March 13, 1987) is an American auto racing driver who drives the No. 27 car for Andretti Autosport in the IndyCar Series. He is the third generation of the famous Andretti racing family. Marco was born to Sandra and eventual IndyCar champion Michael Andretti. Marco's paternal grandfather Mario was a highly successful racing driver, who raced professionally for four decades and had success in the United States and all over the globe in various categories of racing, including winning the Formula One Drivers' Championship in 1978. Other Andretti family members also have had success in various categories of racing. Still barely out of high school, he raced in the Star Mazda series in 2005 and also made six starts in the Indy Pro Series. He won three times – at St. Petersburg, the Liberty Challenge, and Sonoma – and finished 10th in points despite only starting half the races. Motorsports journalist Gordon Kirby suggested at the Champ Car finale in Mexico City that the youngest Andretti would be replacing Dan Wheldon in his No. 26 Jim Beam Dallara-Honda for 2006 with Michael Andretti coming out of retirement to run a fifth car for his Andretti Green Racing team at the Indianapolis 500. Though a novel proposition to some, it was later confirmed in a December 15 press conference that he would move up to the Indy Racing League full-time as the youngest driver in series history and would trade sponsors – the New York Stock Exchange and Motorola – with Dario Franchitti as Andretti was not old enough to run an alcohol-sponsored car. In his rookie start on March 26, 2006 at Homestead-Miami Speedway in the No. 26 New York Stock Exchange Dallara Honda, Andretti started 13th but broke a halfshaft in his first pitstop, eliminating him from the race. With his Rookie of the Year performance in May at the Indianapolis 500, he became the third Andretti to finish in the top five in his first Indianapolis 500 appearance, after father Michael (5th in 1984 Indianapolis 500) and grandfather Mario, who finished third in 1965. Andretti finished second to Sam Hornish, Jr. in the second closest finish in Indianapolis 500 history at a margin of 0.0635 seconds. 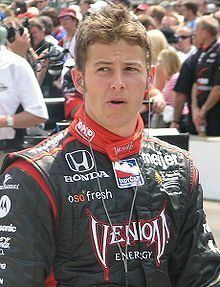 On August 27, 2006, Andretti became the youngest winner – at the age of 19 years, 167 days – of a major open-wheel racing event (later to be replaced by Graham Rahal) as he scored his first career Indy Racing League victory at Infineon Raceway in Sonoma, California. He held the record until April 2008, when Graham Rahal won the 2008 Honda Grand Prix of St. Petersburg aged 74 days younger. Andretti's win established him as the 2006 Bombardier Rookie of the Year. The 2007 season was not as successful for Andretti. He failed to finish ten times and only completed 7 races. The team struggled to find balance on 1.5-mile (2.4 km) ovals, with accidents eliminating him from the races in Japan, Indianapolis, Milwaukee, and Chicago, as well as the Mid Ohio road course. After finishing second at Michigan, Andretti finished eleventh place overall with 350 points. Andretti ran his first night race at Homestead-Miami Speedway, the first race of the 2008 season, with a 2nd-place finish behind Scott Dixon. He also led the most laps of the race – leading 85 – and received an additional three points. At St. Petersburg, Andretti snapped a half-shaft on his car trying to leave the pits, causing him to retire. In the third race of the season at Motegi, Japan, Andretti spun out on the first lap of the race. At the 2008 Indianapolis 500, Andretti finished third, after leading several laps. During the race, he passed teammate, Tony Kanaan, who then crashed into the wall, blaming Andretti. A week later he captured his first IndyCar Series pole at the Milwaukee Mile and became the youngest IndyCar pole winner at the time – at the age of 21 years, 79 days – but crashed out with 3 laps to go in the race. His car slipped up the track, collecting Ed Carpenter, which in turn caused Vítor Meira to go airborne as he drove over Andretti's tire. The eventual winner, Ryan Briscoe just missed the wreckage, as Andretti finished 21st. At Texas Motor Speedway, Andretti had one of the best cars and was able to drive the high line all night, but Ryan Hunter-Reay and Andretti made contact with just a few laps to go. Andretti finished third at Iowa, and then ran a strong race at Richmond but lost position when he pitted under green and a subsequent caution allowed the race leaders to pit under yellow; he finished ninth. Andretti finished fifth at Watkins Glen, before mechanical failure caused his car to crash out at Nashville. He also raced earlier the same day in the American Le Mans Series race at Lime Rock Park. At Mid-Ohio, Andretti got caught up in a four-car wreck on a restart on lap 42 which ended his race, before a 17th-place finish at Edmonton after contact with his teammate Danica Patrick. At Kentucky, Andretti took the lead from Scott Dixon, but as the race neared its end, all drivers had to pit for more fuel and Dixon took the win, while Andretti finished third. Andretti failed to finish higher than eighth in the final three races, as he finished seventh in points. The 2009 season began on two street circuits, giving Andretti an opportunity to show the benefits of his A1 Grand Prix experience. At St. Petersburg he tangled late in the race with veteran Alex Tagliani, finishing 13th, but overcame a 19th place start in Long Beach to finish 6th due to a different pitting sequence. This was Andretti's first time at Long Beach, a circuit at which both his father and grandfather won multiple times. After a 6th-place finish at Kansas. Andretti looked to Indianapolis, where he had been 2nd and 3rd in two of his three starts. Starting 8th, Andretti attempted to pass KV Racing Technology's Mario Moraes on the outside of the South chute between Turns 1 and 2. Moraes moved towards the wall, apparently unaware that Andretti was outside of him, and both cars collected the wall. Both Andretti and Moraes expressed their displeasure with each other in their on-air interviews. 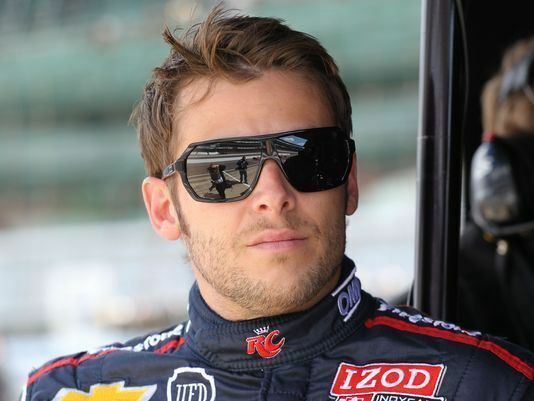 Andretti called the second-year driver "clueless" and said that "he doesn't get it and never will. I should have known who I was racing with." The remainder of the year did not yield much success, as Andretti's best finish of the year was 4th at Texas. He continued his improved form on road and street courses, finishing 5th at Watkins Glen, 8th in his first race in Toronto – where his father won a record seven times – and 6th at Mid-Ohio before finishing 8th in the final standings. In 2011, Andretti placed 9th at Indianapolis after starting 27th. On June 25, 2011, Andretti won his second IndyCar Series race at Iowa Speedway. It was his first win in 79 races since his win at Sonoma Raceway in 2006. The 2012 season was a struggle for Andretti. He started the year with a 14th place at St. Petersburg, 11th at Alabama, 25th at Long Beach, and 14th at São Paulo. He led the most laps (59) at Indianapolis, but hit the Turn 1 wall on Lap 188. Andretti continued the season with 11th at Detroit, 17th at Texas, 15th at Milwaukee, and a best finish of the season at Iowa, where he finished 2nd. Following his runner-up at Iowa, he had 16th at Toronto, 14th at Edmonton, 8th at Mid-Ohio, and 25th place at Sonoma. At Baltimore, Andretti made another finish in the back of the field, finishing 14th. Just as the season was about to end, he achieved the second pole position of his career at Fontana, finishing the race 8th. Andretti finished 16th on the point standings. Andretti started off the 2013 season with a third-place finish at St. Petersburg. This was followed by 2 seventh-place finishes at Barber and Long Beach, matching his top-ten tally from the 2012 season. In the fourth race of the season at São Paulo, Andretti finished third and was able to move to second in the championship thirteen points behind Takuma Sato. He also led his first seven laps of the season. At the Indy 500, Andretti qualified 3rd and was consistently in the top 5 throughout the race. He led 31 laps and finished 4th after two late yellow flags that prevented him from moving forward in the field. 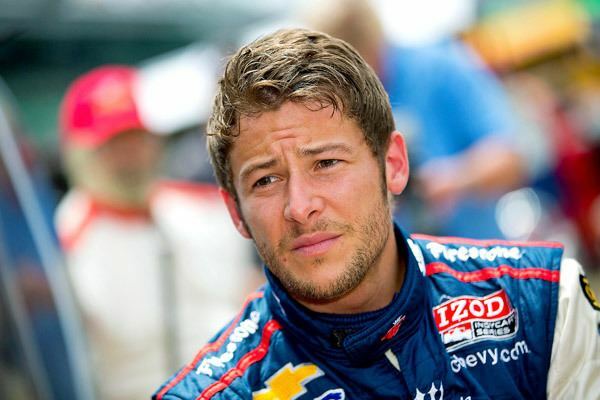 After the race, Andretti said he was "frustrated" with the finish because he had not been below fourth all race. However, after the 500 he took the points lead by 11 points over Takuma Sato. He continued his season with the first double header at Detroit, finishing 20th in the first race – his lowest finish of the season – and 6th in the second race, marking improvement between the two. At Texas, he performed relatively well, staying within the top 10 for most of the race, and later finishing 5th. He claimed his third pole position at Milwaukee, but despite his success in qualifying, his engine blew after the first pit stop, leaving him with a 20th-place finish, before he finished ninth at Iowa. At Pocono, where his grandfather and father had once raced, he was at the top of his game, setting the track record for the fastest lap, and gaining a 4th career pole. Despite leading early in the race, he faded to a 10th-place finish in the end. At the Toronto double header, he qualified and finished in the top 10, staying consistently well during the race. He finished fourth in race one, and finished ninth in the other race at Toronto, without any other events altering his finish. At Mid-Ohio, he finished 9th, without having many eventful occurrences throughout the course of the race. He finished the season fifth in points. Honda Racing F1 announced in December 2006 that Andretti would be presented with an opportunity to test their Formula One car, and on December 15, Andretti drove their Formula One car at Jerez in Spain. Honda sporting director Gil de Ferran commented that he had done a good job. 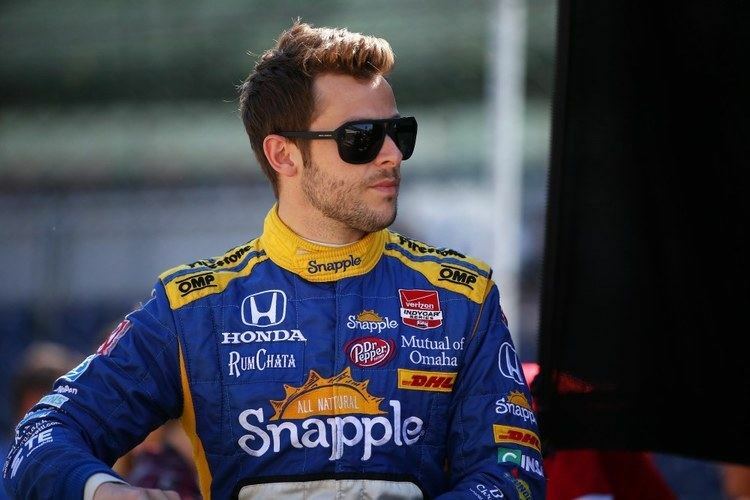 Andretti said that he had greatly enjoyed the test but also told reporters that he wishes to enter Formula One only after he has won the Indianapolis 500. On February 7–8, 2007 Andretti participated in a second Honda Racing F1 test for two days in Jerez, Spain. As in the previous test Andretti drove the team's 2006 Formula One car. His (unofficial) fastest lap of the day on February 7 was less than 1.5 seconds slower than Honda team driver Jenson Button's fastest time. His (unofficial) fastest time on February 8, in changeable conditions, was less than one second slower than that of the 2005 and 2006 Formula One World Drivers' Champion Fernando Alonso's fastest lap. Andretti drove in the ALMS Sebring 12-hour endurance race for the Andretti Green Racing XM Satellite Radio car in March 2008. He was able to put in times in the 1 minute 48 second range that neither of his co-drivers were able to match. Although the car was retired early from the race, it was in the position for a podium finish. On July 12, 2008, Andretti raced in the American LeMans race at Lime Rock Park, Conn in the AGR XM Acura. Later that same day, he raced in the IndyCar Series race in Nashville. Andretti, Franck Montagny and Tony Kanaan raced at the Petit Le Mans on October 4, 2008. A late-race incident retired the #26 XM Radio Acura early, with a seventh-place finish in LMP2 and 16th overall. Andretti made his Rolex Sports Car Series debut in the 2012 24 Hours of Daytona, driving the No. 2 Starworks Motorsport Riley-Ford with Ryan Hunter-Reay, Michael Valiante, Scott Mayer and Miguel Potolicchio, finishing 10th overall. 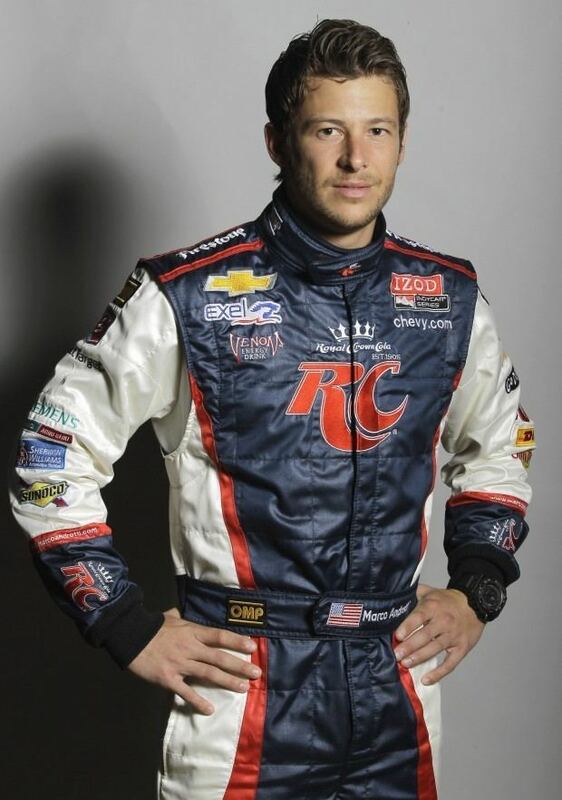 On November 3, 2008, Andretti was confirmed to be racing for A1 Team USA at the second round of the 2008–09 A1 Grand Prix season. Andretti was given the opportunity to race after Andretti Green Racing was revealed to be taking over the management of A1 Team USA starting with the 2008–09 season, and his father Michael Andretti became seat holder. Andretti competed for Andretti Autosport in the fourth round of the 2014–15 Formula E season in Buenos Aires, replacing Matthew Brabham. For the fifth round in Miami Andretti was replaced by Scott Speed.